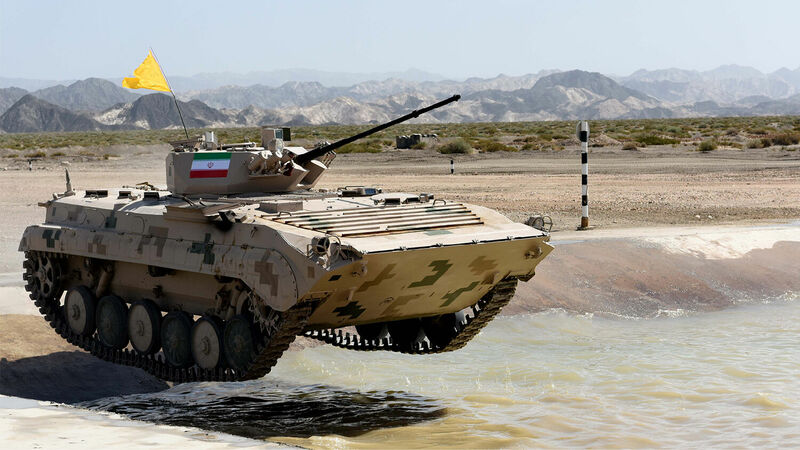 An Iranian infantry fighting vehicle competes in the Suvorov Attack Race as part of the International Army Games 2018 on Aug. 5, 2018, in China. Iranian military leaders have announced a strategy that will lead to Iran’s destruction! “If there is any intention of attack against our interests,” he added, “and we see evidence of it, we will not remain passive and allow the country’s security and peace to be endangered.” In other words, preemptive attacks against anything deemed contrary to Iran’s interests are on the table. Bagheri mentioned the change of tactics in regard to Iran’s military drills throughout 2018, which were more offensive in nature than previous drills. Iran’s announcement is significant in light of its recent confrontations with Israel. On January 20, an Iranian surface-to-surface missile was fired by Iranian-backed forces from Syria. It was flying toward a ski resort in the Golan Heights where it could have killed Israeli civilians, had it not been intercepted by Israel’s Iron Dome missile defense system. The missile attack was meant to dissuade Israel from getting further involved in Syria and launching air strikes against Iranian targets in Syria. Iran’s presence in Syria is a grave threat to Israel’s security. With a path through Syria, Iran would have a clear land bridge through Iraq and Syria to Lebanon to provide weapons to its terror proxy, Hezbollah. It would also give Iran a foothold on Israel’s northeastern border. Along with his announcement, Bagheri asserted that Iran has “no interest in other country’s interests and territory.” This may sound altruistic, but looking at Iran’s long-standing strategy, gobbling up territory is not its style. Iran uses proxies like Hezbollah and Hamas, the Houthis in Yemen, and others to do its bidding in regions where it holds no territorial claims. In weak or weakened nations like Syria, Iran does not need to claim land as its own. An Assad regime indebted to Iran for helping it eventually win its civil war would give Iran leverage to use its territory (perhaps for launching more missiles at Israel or even invading through the Golan Heights) without actually taking that territory. Despite Iran’s threats against Israel, we can confidently know that Iran will not succeed in its goal to destroy the Jewish state. Instead, Iran’s new offensive strategy is leading to its own demise! Daniel 11:40 says, “And at the time of the end shall the king of the south push at him: and the king of the north shall come against him like a whirlwind, with chariots, and with horsemen, and with many ships; and he shall enter into the countries, and shall overflow and pass over.” Our free literature proves who these players in international politics are. The king of the north, as proved in Germany and the Holy Roman Empire, is German-led, Catholic Europe. Notice that the king of the south, Iran, pushes at the king of the north, German-led Europe. Is there anything that declares a pushy foreign policy like a nation’s military leaders declaring an offensive strategy? Being offensive implies taking the attack to your enemies—pushing toward them militarily! Iran has pushed at Europe by sponsoring terrorist attacks and supporting terror proxies embedded in other nations. Now, it is ready to push using its own military strength! Daniel 11:40 says that Europe will retaliate against Iran’s pushes “like a whirlwind.” When the king of the north strikes back, the king of the south will suffer a swift and thorough defeat. Read The King of the South for a thorough understanding of this and related prophecies that will soon be fulfilled!